Msgr. 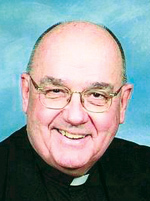 Samuel E. Shoemaker, 75, pastor of St. Ignatius Parish in Yardley and former chancellor for the Archdiocese of Philadelphia, died Jan. 26. Born in Philadelphia, he was the son of the late Samuel H. Shoemaker, a convert to Catholicism, and Frances B. (Kolek) Shoemaker. He was a second cousin to Mother M. Neomisia, C.S.F.N., the founder of Holy Family College and superior general of her congregation. He attended St. Bartholomew School and St. Joseph’s Preparatory school before entering St. Charles Borromeo Seminary. He was ordained May 21, 1966 at the Cathedral of SS. Peter and Paul by Archbishop John J. Krol and his first assignment was as parochial vicar at St. Gabriel Parish, Philadelphia. He also served at St. John Bosco, Hatboro and Epiphany of Our Lord, Norristown. After further Studies at Villanova University and The Catholic University of America, where he earned a JCD in canon law in 1976 he was assigned to the Chancery Office of the archdiocese, serving successively as assistant chancellor, vice chancellor and chancellor. In that era the chancellor had much greater duties in the structure of the archdiocese than today, with membership in many archdiocesan committees. Msgr. Shoemaker worked very closely with Bishop Martin N. Lohmuller, who was vicar general in curia and he also resided at the Cardinal’s Residence in Overbrook. “I fondly remember Msgr. Shoemaker, he was a faithful friend and of great assistance to Cardinal Krol,” said Bishop Lohmuller on hearing of Msgr. Shoemaker’s death. In 1989 Msgr. Shoemaker was named pastor of St. Ignatius, and remained so for almost 27 years until his death. Meanwhile he remained friends with brother priests from his seminary days. Pastorally, he recalls how wonderful Msgr. Shoemaker was with the small children, especially how he would gather them around the crèche at Christmas time. This year would have been Msgr. Shoemaker’s 50th anniversary of priesthood and Samantha Flemming, the president of the parish Home and School Association, was a member of a committee that was planning a celebration for the anniversary. She is the mother of four school children and for her, the anniversary was an excellent example of commitment for her children in an era when such long-term commitment is rare. Betty Ruppersberger, a long-time St. Ignatius parishioner, recalls how her little grandson came from school after hearing of Msgr. Shoemaker’s death upset because his pastor will not be able to hear his first penance. A parish Mass will be held at St. Ignatius Church for Msgr. Shoemaker on Sunday, Jan. 31 at 6 p.m. His funeral Mass will be celebrated by Archbishop Charles J. Chaput at St. Ignatius on Monday, Feb. 1 at 11 a.m. Among the concelebrants will be Msgr. Francis J. Statkus who was his predecessor as chancellor; Fathers Charles Zlock, Jonathan Dalin and Father Stajkowski, who will be the homilist. Msgr. Shoemaker is survived by his cousins, Karen Shoemaker Turbyfill and Fred Vopper. This was a wonderful, committed Priest and servant of God who allowed me to see his heart; appreciate his pastoral skills and come to respect, admire and love him. God bless you Father Sam ! Monsignor Shoemaker was a brilliant man. As his music director and organist for many years we shared in the planning of many Masses, funerals and weddings. I heard him preach, often several times a weekend. We worked closely together. I was able to record many of his homilies which were always a blessing. I will truly miss him and his passion for excellence.